Wondering what to do with your ashtrays on July 1? Smoking in public places is banned in the UK on Sunday July 1 2007. 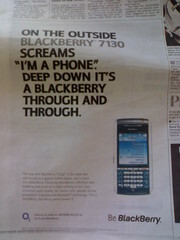 Our first campaign for BlackBerry is live this week. That’s Albion making a proper grown-up advertising campaign, for a proper grown-up client! You are currently browsing the archives for the We thought of this category.